December 13, 2014. 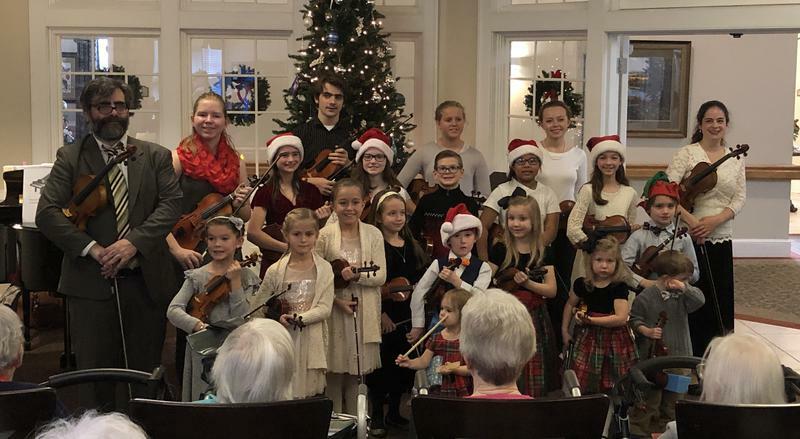 We returned to Kerner Ridge Assisted Living for our Winter Recital. The residents enjoyed watching the students share their music. And, we were happily surprised by a lovely new piano that had just been donated to the living center! 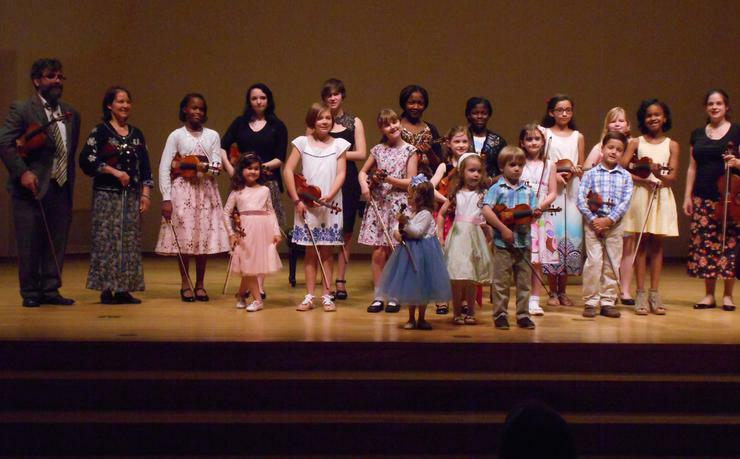 May 23, 2015: We had a lovely Spring Recital at Brendle Recital Hall. For additional photos, videos, and news please visit the Facebook page. 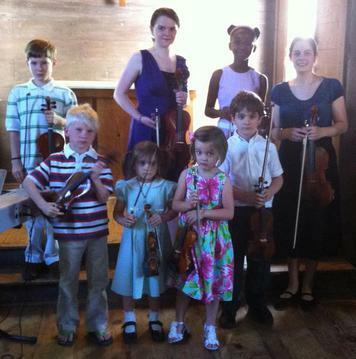 May 19, 2013: We had a lovely Spring Recital at Mt. Pleasant Church in Tanglewood Park. 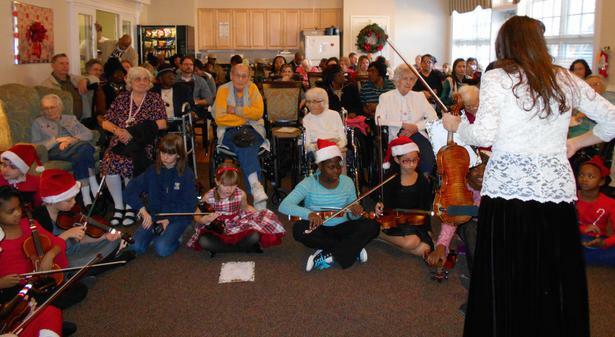 December 9, 2012: We gave a winter performance at Kerner Ridge Assisted Living in Kernersville. Copyright 2011-2019 Amelia Weesner. All rights reserved. Unauthorized use of any photographs and/or content from this website is strictly prohibited. August 15, 2015: We played at the Kernersville Honeybee Festival! It was great to be represented at such a large and fun community event! It was good that we only played for 20 minutes because it was HOT. Next time maybe I will provide VERY COLD drinks! 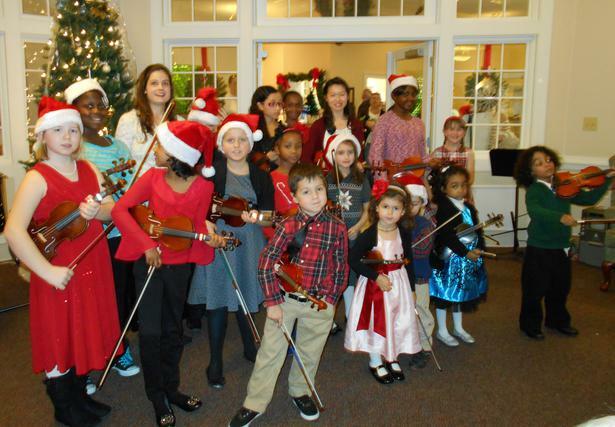 From our Winter Performance December 2015: These students have worked hard on Bach Minuet 2 melody & harmony. For this performance, five students played melody and two students played harmony. 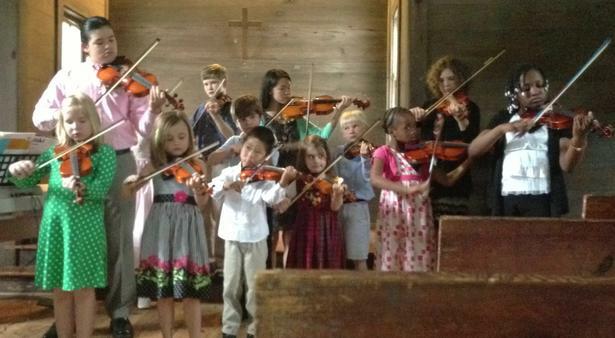 May 20, 2012: We celebrated the end of our year with a Spring Recital at Mount Pleasant Church in Tanglewood Park. 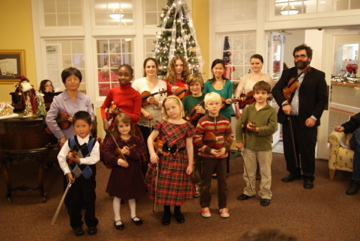 December 17, 2011: For our Winter Performance, and as a service to our community, we played at The Gardens at Bradford Village in Kernersville. I began this studio in the summer of 2011, so this was our first performance. May 21, 2016: We had a lovely Spring Recital! What a busy year we had! I was happy to see that the students seemed to be more motivated than ever! From our Spring Recital on May 21, 2016: Gossec Gavotte! This is the last piece in Suzuki Book 1. Some of these students are recent graduates from Book 1, and the others are in Book 2. December 4, 2016: We joined the Kernersville Christmas Parade for the very first time! The cold and rainy weather did not stop us from playing some carols on violin! We had a great time! 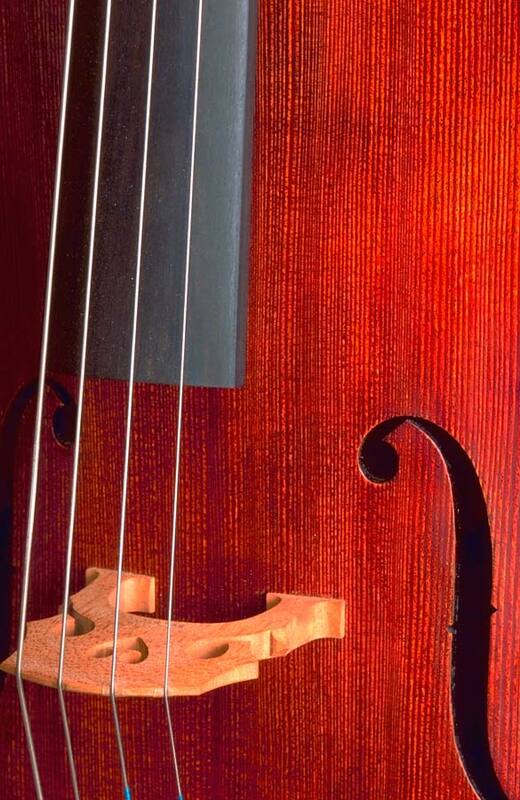 December 5, 2015: Merry Christmas and Happy Holidays from Weesner Violin Studio! 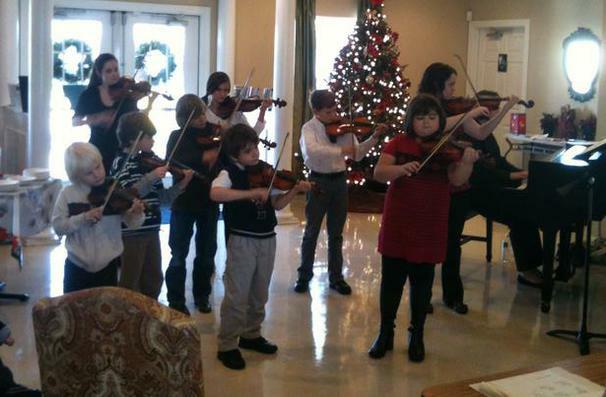 We had a Winter Recital at Arbor Ridge Assisted Living Center. The students played great! May 20, 2017: This is a beautiful performance of Twinkle from our Spring Recital! It just makes me smile! December 2, 2017. Here are excerpts from all of our Winter Recital solos! June 2, 2018. 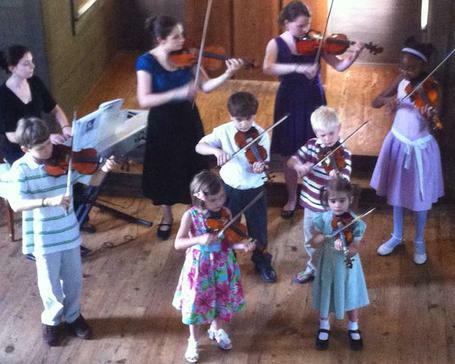 A lovely Spring Recital. We were overjoyed with all of the students' performances. December 1, 2018. Here is a photo from our Winter Recital! 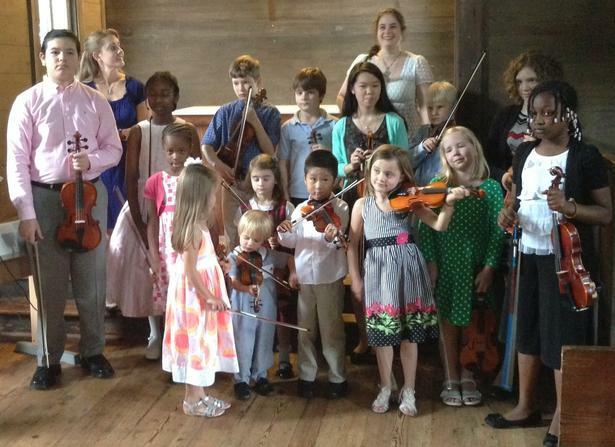 Our program included Bach Gavotte in D major, Vivaldi Concerto in a minor, and Seitz Concerto No. 5. After the recital, a very small number of us played for some Alzheimer's patients.